It is early January, and we have all been bombarded with advertising, social media posts and probably a few conversations about dieting, resetting, detoxing and all sorts of keyword-heavy suggestions on how to improve our lives. I just say, “Ugh.” Enough with the crazy vocabulary, crazier diets and mandatory hating yourself. Of course, we could probably use a few more vegetables and a little (or a lot) more activity, but we don’t need to beat ourselves up over it. Part of a healthy life is enjoying the moment, even if that moment isn’t perfect. Balance those last Christmas cookies with taking the dog for a walk. Develop a new favorite salad dressing and toss it with a big bowl of greens as a side with every meal. And speaking of greens, those aren’t the only healthy vegetables. There truly is something to be said for eating the rainbow. Currently, I am stuck on all the golden hues. I am baking sweet potatoes, roasting acorn and butternut squashes, and even giving carrots top billing in my menus. If you are only dispatching raw carrots to the crudité plate, you are missing out. The high heat of roasting brings out the natural sweetness in a way that makes carrots just as delicious as candy. These tubers are also packed with nutrients, fiber and antioxidants (just in case you were missing those healthy vocabulary words). 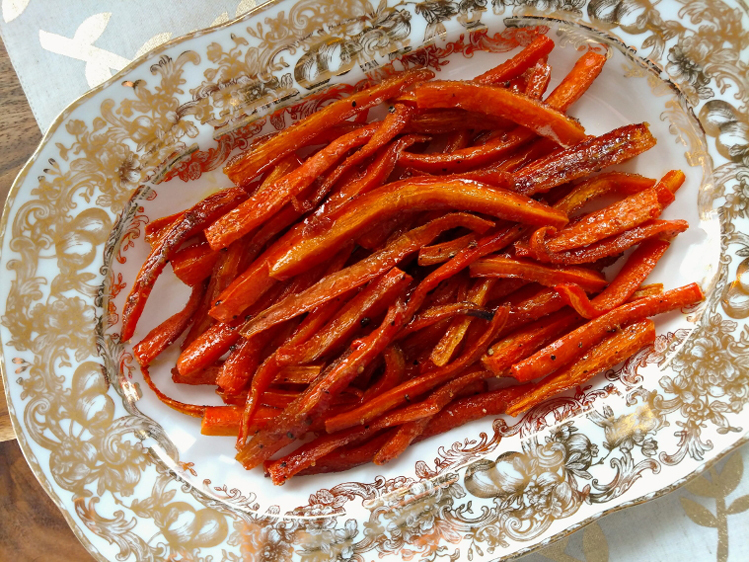 Carrots roasted in a brown sugar glaze provide a sweet treat without derailing any New Year's healthy eating resolutions.